When WWI broke out in August 1914 it was decided to change the name of the Russian capital from the Germanic St. Petersburg to the more Russian equivalent, Petrograd. Germany was now Russia's enemy and all of the forces within the country's power had to be employed to defeat her. Most of the city's industry began to work to support the war effort and many of Petrograd's buildings, including a large portion of the Winter Palace, were turned into hospitals. Most construction work in the city stopped. The war did not progress well for Russia. The Tsar's government discredited itself and political tensions began to rise. To further exacerbate this situation, food supplies to the Russian capital deteriorated significantly towards the end of 1916. (Located at the north-western edge of the Russian Empire, Petrograd was supplied with food via the railway network, which sufferred severe breakdowns during the war, making it increasingly difficult to supply the city with provisions.) Petrograd stepped into the New Year with its inhabitants infuriated with waiting in long lines to buy food at the city's stores. The combination of social unrest and the wartime grievances brought about the February revolution of 1917 and the abdication of Nicholas II. At the time of the revolution the Tsar was in Mogilev at the army headquarters and his family at Tsarskoye Selo (now Pushkin). The political and economic crisis continued throughout 1917 and in the fall the Bolshevik party, led by Vladimir Lenin, grasped political power. On October 25 (November 7) 1917 blank shot fired by the cruiser "Aurora" gave the signal to the waiting workers and soldiers to storm the Winter Palace, the current residence of the democratic, but largely inefficient Provisional Government. Most of the ministers were arrested and thus began 73 long years of Communist rule. At the beginning of 1918 Civil War (1918-1921) broke out and the revolutionary soldiers and workers of Petrograd became the core of the Red Guard, which later turned into the Red Army. While the men were leaving the city for the fronts of the Civil War, a significant portion of the population migrated to the countryside, where families inevitably found it easier to provide to feed themselves. The population dropped from 2.3 million in 1917 to 722 thousand by the end of 1920. By the beginning of 1918 German troops were so close to Petrograd that the Bolshevik government under Vladimir Lenin decided to move the capital to Moscow, which was still a long way from the German front. Petrograd was abandoned by the governemnt and many of the city's street names were altered according to the revolutionary fashion of the day. 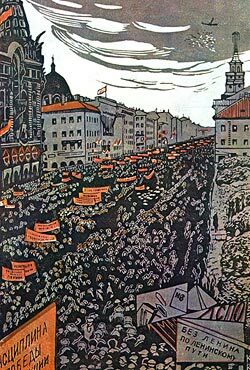 Palace Square became Uritski Square (after an assassinated Bolshevik politician) and Nevsky prospect became the Prospect of 25 October (after the October Revolution). A number of Revolutionary monuments were erected, but most of them were poorly designed and constructed and did not last long. After the end of the Civil War the city of Petrograd started to recover under the New Economic Policy (NEP), which had been proclaimed by the Bolsheviks and allowed certain elements of a market economy to operate. 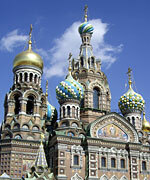 In 1924 the name of the city was changed to Leningrad, a symbol of its transition to a Socialist city.